Here's a quick list of what to do in Knoxville, TN for a weekend getaway. We know most of you will only think of football when you hear the words, “Knoxville, Tennessee”, but there is so much more to downtown Knoxville than Neyland Stadium. However, if you are a raving fan, here’s a link to get tickets to this year’s UT vs. Florida game. Go Vols!! 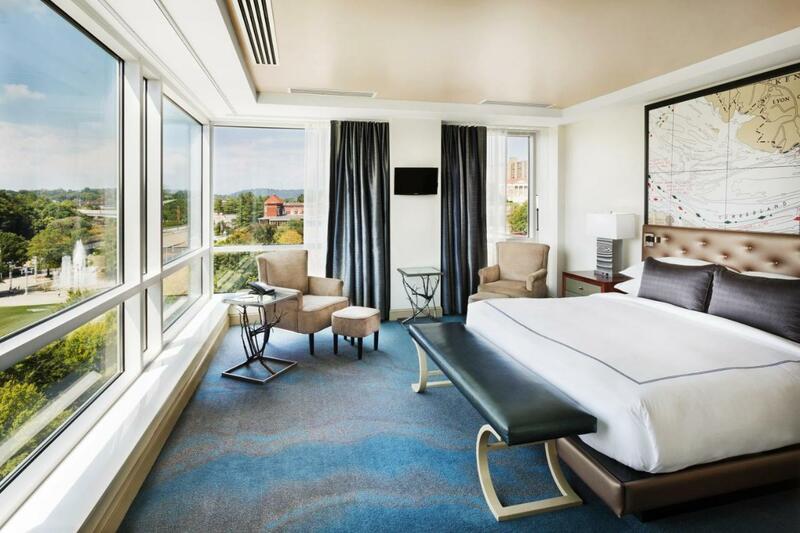 We recently took the opportunity to stay one night with our kids, and discover all that Knoxville, TN offers on the weekend. What we discovered is that visiting Knoxville on the weekend is a great idea! Here are ten fun things to do in Knoxville that will make you want to spend the weekend visiting Knoxville, TN. If it’s too far to drive, the local airport has non-stop flights to several US destinations. 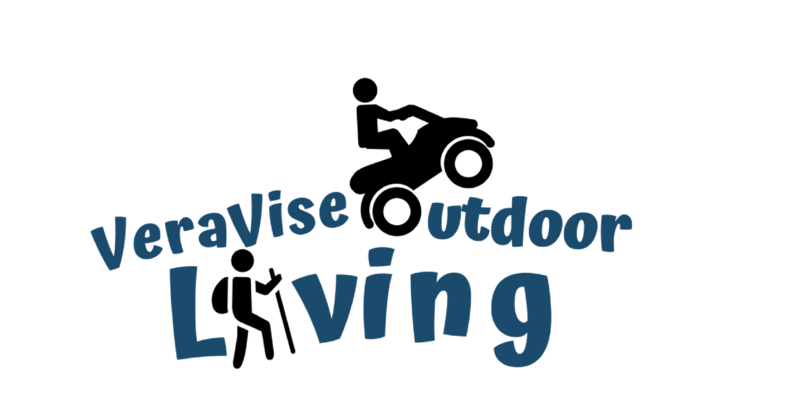 You can check airline rates here. Knoxville’s Market Square is the place to be downtown on the weekend so why not hit the ground running with breakfast right in the middle of the action. We chose to have chicken and waffles at Myrtle’s Chicken & Beer and it did not disappoint. As you know, we are always happy when a restaurant can accommodate our kid’s food allergies and Myrtle’s Chicken & Beer did just that. Word of warning, better get some water as the chicken is S-P-I-C-Y. Knoxville’s Farmer’s Market is teeming with so many great local goods and foods. It’s a great place to stock up on your favorite produce or grass fed beef if you have the means to keep it until you get home. Maybe take a great rotomolded cooler with you so you can stock up. I have done this a time or two. However, my favorite local good is to stock up on local honey. The kids were also excited to find a local dark chocolate vendor producing nut free chocolate. Always a plus!! To be honest, mom really liked Lirio Chocolate too! So, yeah, we bought honey and chocolate! No judgment, please! Throughout Market Square there is plenty of live music to enjoy. Just watch out you don’t end up like my daughter and get snagged to join in. Before setting out to explore the rest of downtown Knoxville on foot, stop by one of the food trucks and refuel! So many great options. If you like brisket, grab a brisket basket at the Tootsie Truck. One of my absolute favorite city tripping activities is to find the historic neighborhoods. Old City Knoxville has some great architecture and some very colorful history. We enjoyed taking a short stroll and capturing some images after our morning in the Knoxville Farmer’s Market. Way back in the dinosaur days, my mom took my brother and me to the 1982 World’s Fair in Knoxville. I don’t have many memories from the event, but it was fun going up to the 4th floor of the Sunsphere and viewing images from the exciting time. It’s reported that nearly 11 million visitors attended the 5 month long World’s Fair which was themed, “Energy Turns The World”. Click here to learn more about visiting the Sunsphere. If the kids are beginning to get hot in the humid Tennessee sun, you can let them splash around in the World’s Fair Park Fountains. We decided against that, but enjoyed strolling along the water before heading over to Gay Street for shopping and cooling off with some ice cream instead. It’s time to shop! I haven’t officially been to a southern city, until I’ve strolled through the Mast General Store. The Gay Street location has been in business since 1898 after a major fire known as the “Million Dollar Fire” burned most of that side of the street’s buildings. You will also find the Knoxville Visitor Center on Gay Street, art galleries, micro-breweries, cafes, and the famous Phoenix Pharmacy & Fountain (more on that below). Phoenix Pharmacy & Fountain is so fun!! The decor is classic old school pharmacy and soda fountain. Stop in for a visit when on Gay Street in Downtown Knoxville, you won’t regret it! Read more reviews on the Phoenix Pharmacy & Fountain here. Okay, I know this last one isn’t exactly something for the whole family, but if you (or your hubby) are a fan of the cocktail known as an “old fashioned” you might consider a relaxing evening in The Drawing Room atop the newly opened luxury hotel, The Tennessean. After Mr. VeraVise read about their “smoked old-fashioned”, he had to try one. We actually spent the night in The Tennessean (read more below about our experience) so it was convenient to stop in for one after checking in. Regardless, the Drawing Room is a nice relaxing spot even if you just order a soda. As this was a last minute stopover for our family, we snagged a great last minute deal. 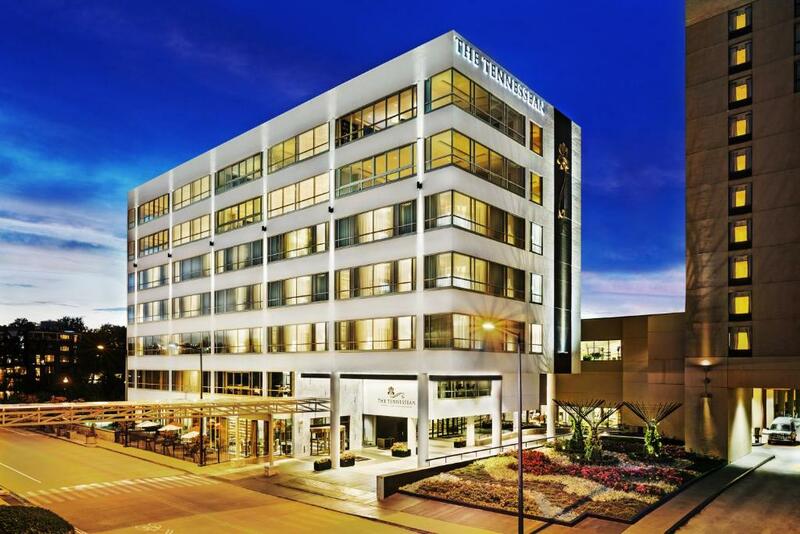 We can highly recommend it as a great place to stay in downtown Knoxville. If you are like us, when we arrive in a city to explore, we like to put away the car and do as much on foot as we can. 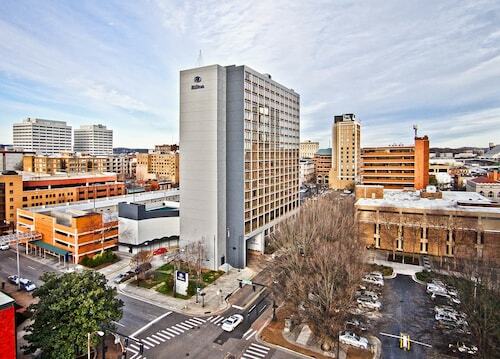 The Tennessean is as close to the main downtown Knoxville attractions as you can get. We especially loved that the skywalk could be easily accessed just outside the hotel and takes you straight to market square. If you have spent much time in a big city with littles, you know that the fewer times you have to traverse heavy traffic on foot, the better. The staff were very friendly and the room was impeccable. On checkout day, they gladly kept our bags so we could continue to explore the city for a while. If you get tired of the city, don’t forget, you can be in the Smokies in just under an hour. Check out our 10 Fun Things To Do In Gatlinburg for some great ideas. We also have a review of a great family hotel just outside of Dollywood. Check out our Home 2 Suites Pigeon Forge Review. We haven’t been to Knoxville yet but this post is inspiring. It’s alway great to read about family-friendly destinations especially ones with a variety of delicious food. You had me at the chicken and waffles and that mouth-watering sundae. What a fun weekend trip to do. So far, every trip to Knoxville has been spent in hotel conference rooms. Boooo! It’s high time we took a trip just to enjoy all that Knoxville has to offer! Thanks for the great ideas, and for sharing on #TheWeeklyPostcard! We were just in Kentucky for 7 weeks and I really wanted to go to Knoxville, but sadly we didn’t make it there. And we just discovered the bliss of chicken and waffles! Never understood it before but now I do! Would like to also check out some of the food trucks there and see what else they have! Thanks for linking up with #TheWeeklyPostcard! Yeah, Knoxville! Been there two years ago and was a stop on my road trip through the Southern States and the Smoky Mountains etc. I had a great time! Thanks for bringing those memories back! I’ve only been to Tennessee once and only for a couple days so I wasn’t able to go to Knoxville. It looks amazing, I can’t wait to visit again and explore the state more! Honestly never knew there was so much cool stuff to do in Knoxville! Great post. Definitely going to check it out. Knoxville looks like a fun town to explore. My husband LOVES root beer floats so a visit to the Pharmacy would be on the list for sure!